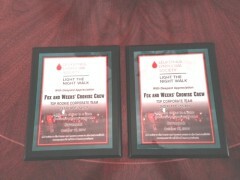 Fox & Weeks is proud to announce that the funeral home’s Leukemia and Lymphoma Society Light the Night team was the Top Rookie Corporate Team in 2014 and finished second overall for corporate fundraising. Light The Night Walk is a fundraising campaign that brings together families and communities to honor blood cancer survivors and remember those who were lost to the disease while shining a light on the importance of finding cures and providing access to treatments for blood cancer patients. Fox & Weeks raised more than $5,400 in 2014 in honor of David Cronise, a longtime Fox & Weeks funeral director who was diagnosed with leukemia in 2014. Fox & Weeks would like to thank everyone who made a donation to the campaign and especially thank everyone who walked with us through downtown Savannah to honor David and everyone else whose lives have been impacted by these insidious diseases. Throughout the country, millions of people contribute to this fundraising effort, and we are very proud we could do our part to help find a cure.